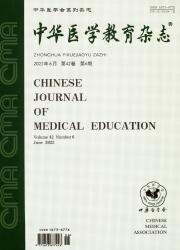 摘要 目的结合现代医学教育模式，探讨八年制医学生合理的“早期接触临床”的教学活动内容。方法采用教师问卷和学生见习报告的形式，了解72名教师和13名学生对“早期接触临床”教学活动的认识，以及有关活动目的、效果和管理的改进意见和建议。结果83．3％的教师明确“早期接触临床”教学活动的目的；59．7％的教师对“早期接触临床”教学活动有兴趣；70．8％的教师同意继续目前的活动内容；31．9％的教师认为“早期接触临床”教学活动达到了预期目的。所有学生认为从“早期接触临床”教学活动中受益匪浅，对临床有了感性认识；61．5％的学生认为收获很大。结论“早期接触临床”教学活动有利于增加学生的感性认识和激发学习兴趣。教师应当运用现代医学教育模式，探索最为适宜的培养学生“自主学习”和“合作式学习”能力的“早期接触临床”教学活动内容和实施方法，为今后临床医学教育教学一体化课程体系的改革做好准备。 Objective To identify the reasonable ＂early exposure to clinical practice＂ teaching activities of 8-year medical students under the guidance of modern medical model education. Methods 72 teacher questionnaires and 13 student reports were used to survey the understanding, purpose, effectiveness as well as management improvement comments and／suggestions for ＂ early exposure to clinical practice＂. Results 83. 3% of teachers ensured the purpose of ＂early exposure to clinical practice＂. 59.7% of teachers were interested in the activities. 70.8% of teachers agreed to continue the current content. Only 31.9% of teachers thought that the activities achieved the desired purpose, nevertheless 100% of the students thought that they benefited from the activities and achieved perceptual knowledge of clinical work. 61.5% of students considered a great harvest from ＂early exposure to clinical practice＂, Conclusions The ＂early exposure to clinical practice＂ had an active effect on increasing the perceptual knowledge and stimulating the learning interest of students. Teachers should use the modern medica｜ education mode to ex- plore the most suitable teaching content and implementation methods to coincide for training students the a- bility of ＂independent learning＂ and ＂collaborative learning＂, and to prepare for the reform of the future integration of clinical education courses.